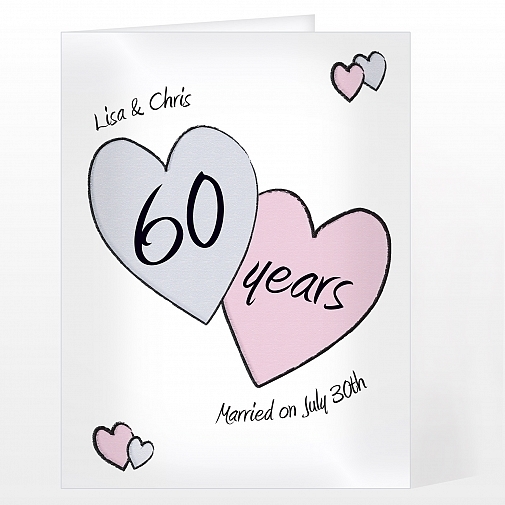 Personalise the front of the card with any message above and below the hearts up to 20 characters per line, the wording '60 years' is fixed. You can also add a message inside the card over 5 lines and up to 20 characters per line. All cards come in a brown outer envelope with a plain white envelope inside. All cards measure 185mm x 132mmOur great value cards include free standard delivery.Card orders received before 1pm will be dispatched the same working day. Ideal for Anniversary.